Bolstered by sports teams, big-name corporations and a burgeoning downtown area, the Southern city’s food and beverage scene thrives. The balcony of Fahrenheit restaurant in features a 360-degree view of Charlotte, North Carolina. Located on the 21st floor of a condominium development and adjacent to a Hyatt Place hotel, Fahrenheit occupies a prime spot in the heart of the city. Fahrenheit’s vista encompasses all that Charlotte has to offer. The thriving city of roughly 810,000 inhabitants is a major financial center. Bank of America, the East Coast operations of Wells Fargo and myriad other firms call Charlotte home, and the city ranks among the top financial destinations in the country. In addition, seven Fortune 500 companies are headquartered in the Charlotte region, including Lowe’s, Duke Energy and Nucor. 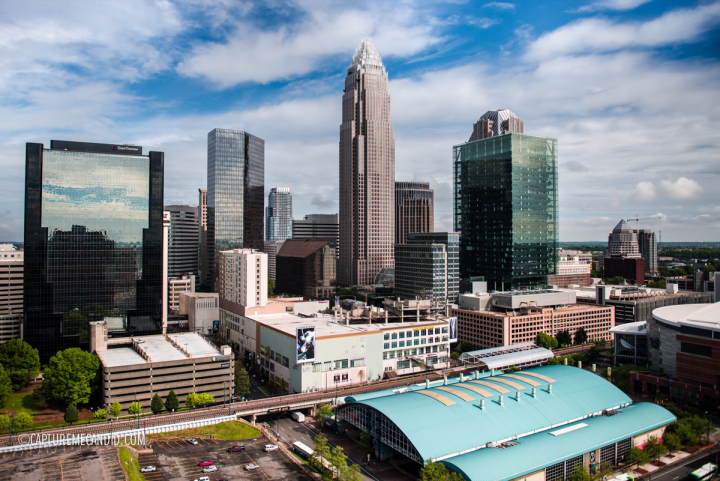 Charlotte is also home to some big-name sports franchises, including the National Football League’s Carolina Panthers and the National Basketball Association’s Charlotte Hornets, as well as minor league baseball’s Charlotte Knights. All three teams play in the heart of the city, contributing to a vibrant urban vibe. Paige Sellers, district manager of on-premise sales for Tryon Distributing, says their presence is reviving a downtown that was hard-hit by the recession. “It’s close to booming, although we’re not there yet,” Sellers says. “It used to be a ghost town at night, but now there’s BB&T Ballpark.” The stadium opened in 2014 and hosts the Knights. 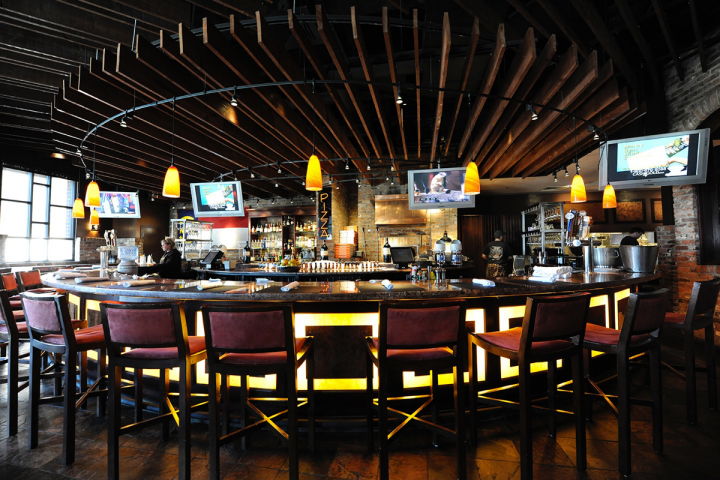 Harper’s Restaurant (Pineville, North Carolina, unit pictured) is one of three concepts in the Charlotte area operated by Harper’s Restaurant Group. 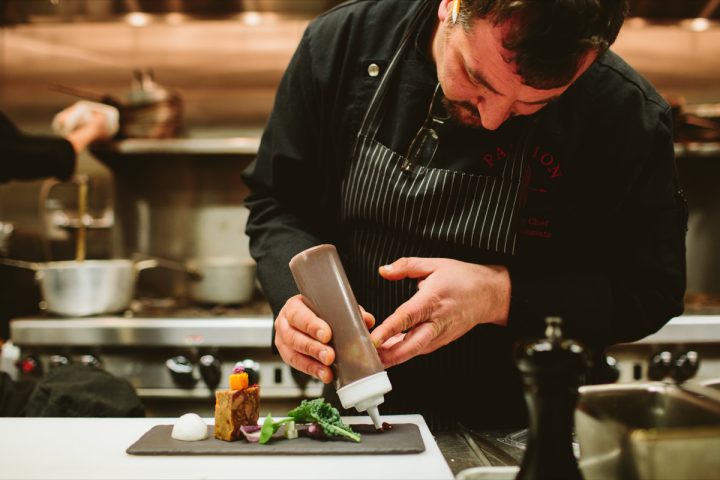 Luca Annunziata, chef at Passion8 Fine Dining & Catered Events, expands beyond the city’s steak-and-barbecue roots while keeping a local focus. Throughout the city, restaurants and bars are challenging the standards. Charlotte is typically viewed as a more conservative, traditional town, and those attitudes can extend to their food and beverage offerings. “The notion of a nice meal out is changing quickly,” says Shawn Paul, general manager of CorkBuzz Restaurant and Wine Bar in South Park. “For many people in this area, dinner at a nice restaurant means going to a steak house. But an increasingly common perception is the idea that you can lose the tablecloth without losing quality.” CorkBuzz Charlotte opened in June and is the concept’s first location outside of New York City. At Passion8, cocktails like the SGQ feature fresh, local ingredients. Some on-premise operators are looking to educate their patrons about a more modern, local approach to food and drinks. Kenan Livermont, beverage director at Soul Gastrolounge in Plaza Midwood, says the recent acclaim for his restaurant and the neighborhood has resulted in an influx of patrons from other parts of the city. “Because we’ve been getting a lot of press and accolades, about 50 percent or more of our clientele on a given night are first-time guests,” he says, adding that the situation presents a learning curve. Soul focuses on small plates, sushi and craft cocktails—offerings that haven’t really infiltrated the larger Charlotte market, which Livermont describes as club-oriented. “People are completely unfamiliar about what we do with tapas and cocktails,” he says. “We’re educating local residents on the way things are done in places like New York City, San Francisco and Los Angeles.” One popular cocktail at Soul is the Bergamotley Crüe ($13), made with Aviation American gin, house-made blueberry-sage syrup and fresh lemon juice, topped with an Earl Grey seltzer foam and served in a Martini glass. Many venues are taking a new approach with food and drinks. At Passion8, the cocktails, beer and cuisine have a heavy local focus. Annunziata notes that all of her restaurant’s signature drinks feature fresh ingredients that are sourced from the immediate region. 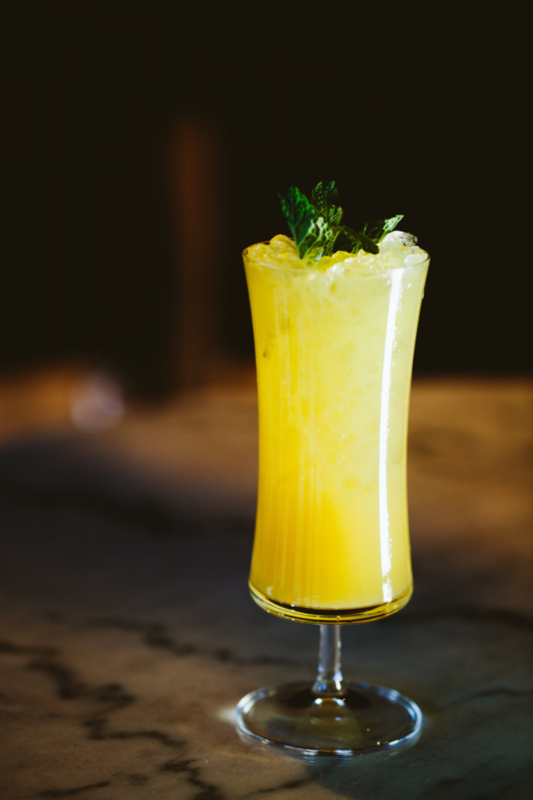 One hot seller is the Calypso ($10), featuring Queen Charlotte Reserve Carolina rum from Muddy River Distillery in nearby Belmont, North Carolina. 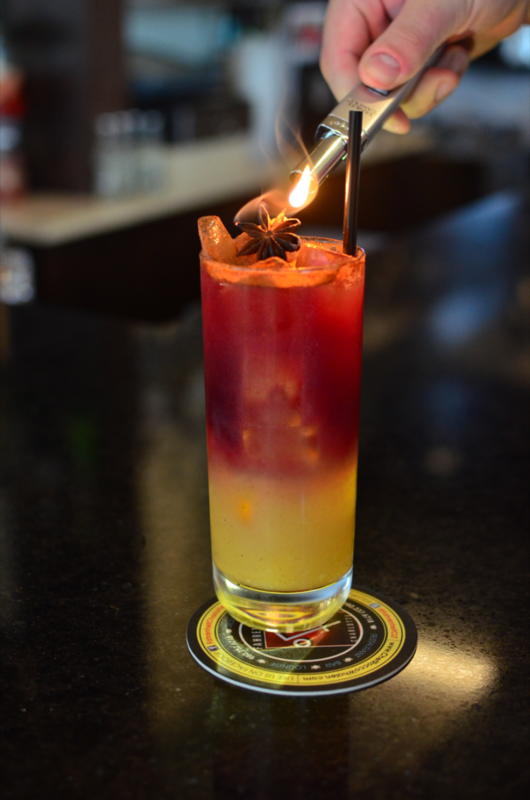 The cocktail also contains Kahlúa coffee liqueur and a shrub made from local strawberries and roasted pineapple. With numerous distilleries in the vicinity, it isn’t difficult to source spirits from nearby either. “On our craft cocktail list, it’s very important to me and to Fahrenheit owner and chef Rocco Whalen to use local products,” Izrael explains. He points to Carolina Distillery’s Carriage House brandy, made with 100-percent North Carolina apples, and Topo Distillery’s spirits, which all use locally sourced ingredients. The number of high-quality products made in the region allow Fahrenheit to create excellent cocktails using local brands. For the autumn, Fahrenheit’s menu features several regionally inspired drinks, including the Chocolate Old Fashioned ($15). The cocktail combines Virgil Kaine rye whiskey from Charleston, South Carolina, with Fee Brothers Aztec Chocolate bitters, Angostura bitters, simple syrup, dark chocolate–chipotle cocoa nibs, an orange slice, orange zest and a Luxardo cherry. Dozens of craft breweries have sprung up around Charlotte in recent years. NoDa Brewing Co. is one of the more prominent in the city. 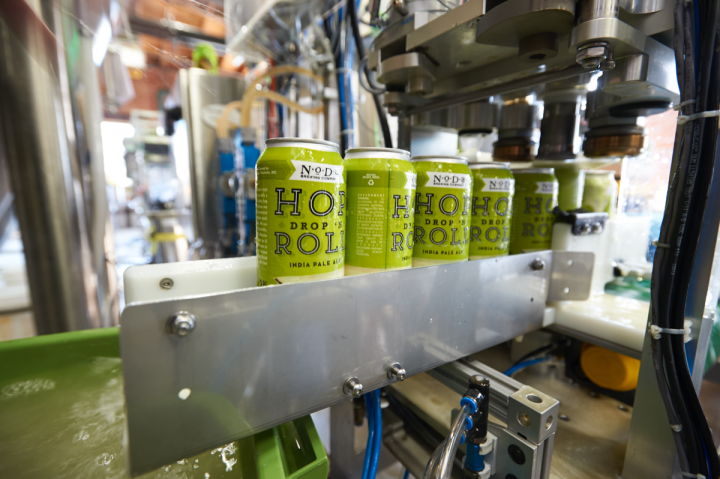 “As the craft beer scene has rapidly expanded over the past few years, so has the demand for our product,” says NoDa Brewing communications director Laura Antanaitis. With demand booming, the brewery moved its base to the site of some old vinegar factories on the neighborhood’s edge in October. Sasser of Harper’s says the evolving nature of craft beer keeps things interesting for consumers. “A lot of these craft breweries will make small batches, so you’re constantly getting fresh ideas and new products,” he notes. 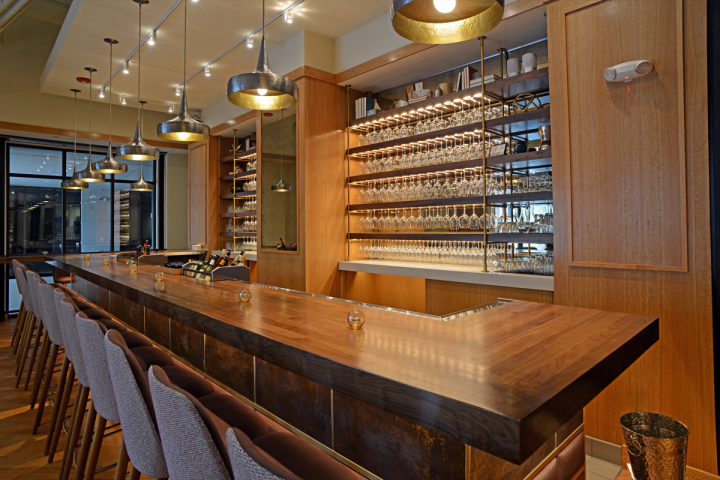 CorkBuzz showcases classic discovery wines, emphasizing exploration and education. At Passion8, there’s “a smattering of larger brands on the list for name recognition,” Annunziata says. “But I try to source from boutique wineries that offer more esoteric wines. We want to introduce people to something different, and it has to be on par with what’s coming out of our kitchen.” The Passion8 wine menu sometimes features local labels like the 2013 Biltmore Estate Chardonnay ($48) from Asheville, North Carolina, among its selection of mainly California, French and Italian offerings.